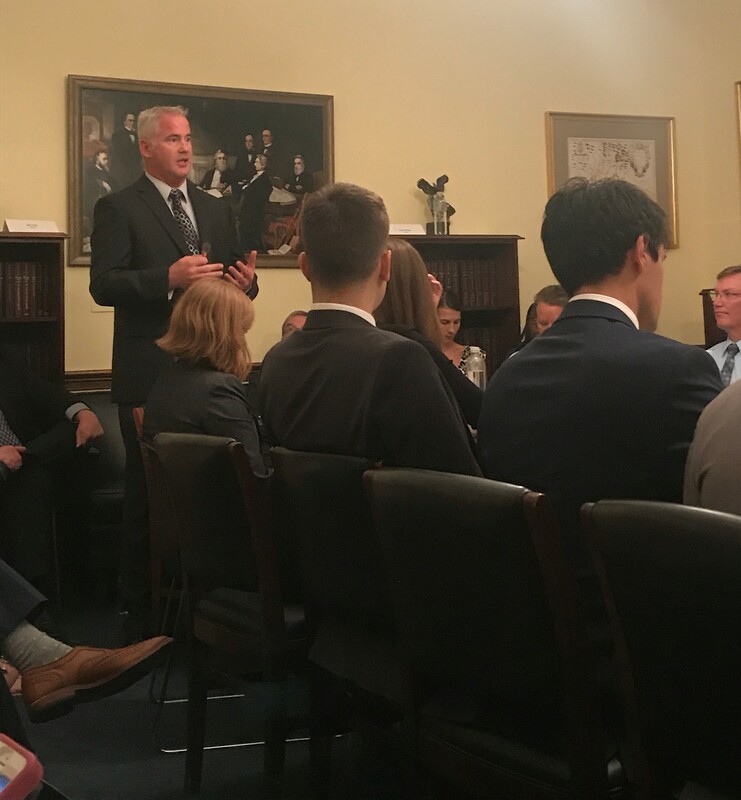 On June 19, 2018, ESA and the U.S. Geological Survey (USGS) held a Capitol Hill roundtable discussion hosted by Congressmen Rob Wittman (R-VA) and John Sarbanes (D-MD) highlighting science used to inform Chesapeake Bay restoration and management. 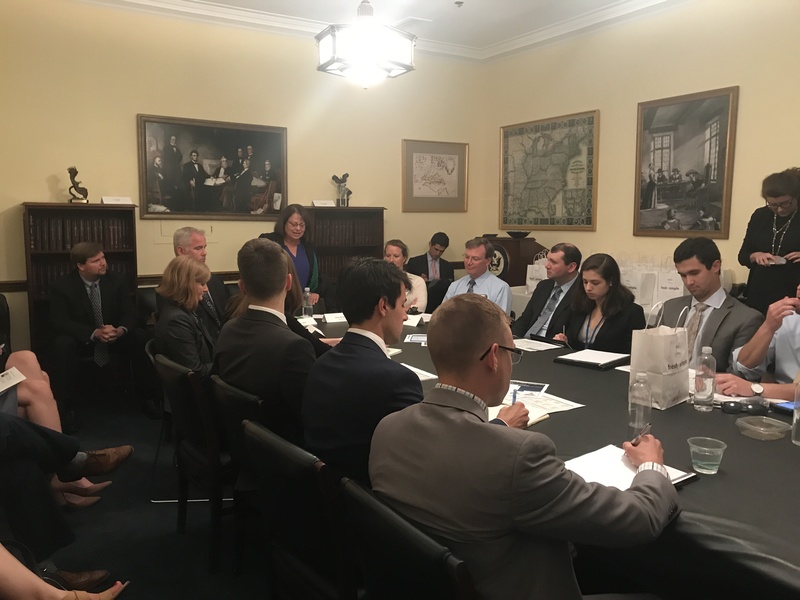 Bipartisan staffers and policymakers crowded into a conference room on Capitol Hill to hear scientists talk about the USGS’s role in providing and coordinating science in the 64,000 square mile Chesapeake Bay watershed ecosystem. It is the largest of more than 100 estuaries in the United States (U.S.) and third largest in the world. The Chesapeake Bay watershed stretches approximately 524 miles from Cooperstown, New York, to Norfolk, Virginia. It includes parts of six states—Delaware, Maryland, New York, Pennsylvania, Virginia and West Virginia—and the entire District of Columbia. It is the first estuary in the nation to be targeted for restoration as an integrated watershed and ecosystem. Numerous stakeholders at the local, state, and federal level use USGS science to inform management decisions. 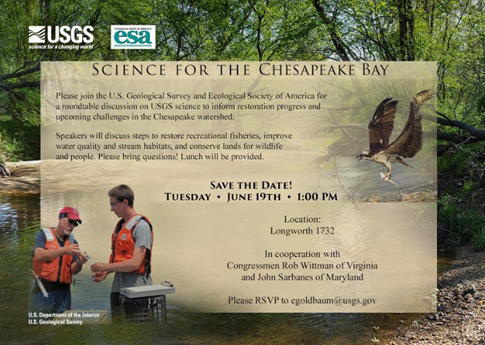 The Environmental Protection Agency, National Park Service, and NOAA are other key federal partners working with the USGS in the Chesapeake Bay. The science and long-term datasets collected by all the agencies also inform management of other estuaries internationally and within the U.S. such as in the San Francisco Bay. Science is showing that improved water quality provides many co-benefits. 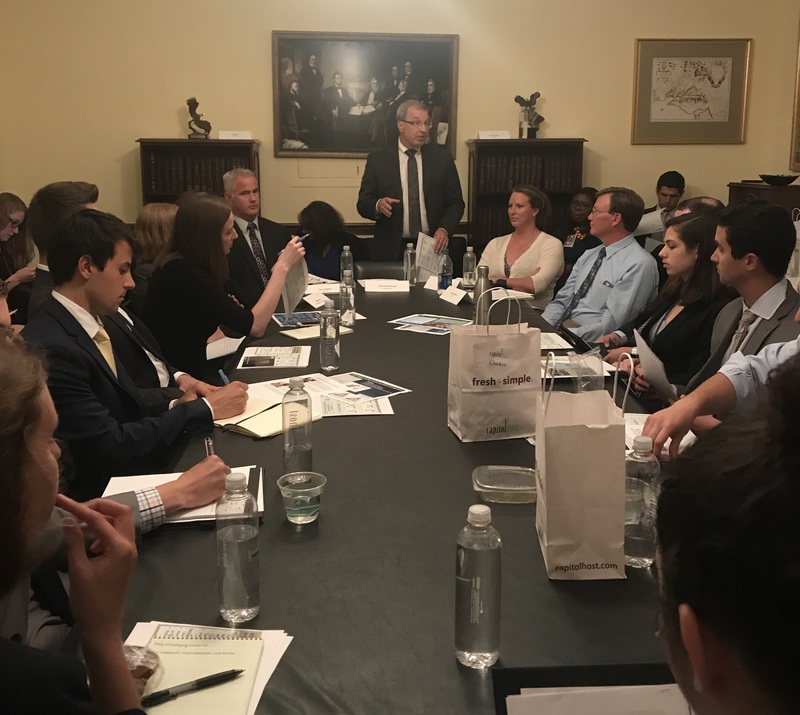 The speakers explained to the Hill staff that the Chesapeake Bay is a globally important ecological and economic resource. The Bay is home to iconic species like the blue crab, over 350 fish species and hundreds of species of waterbirds. Recreational and commercial fisheries in the Chesapeake generate $3.1 billion in economic value a year and outdoor recreation in the area generates $20 billion a year. While the Chesapeake Bay is currently experiencing a record recovery – blue crab populations are currently at an all-time high and the number of acres of submerged aquatic vegetation has surpassed 100,000 for the first time in decades — the ecosystem is still threatened by development, sea level rise, and invasive species such as the blue and flathead catfish that have rapidly expanded into nearly every major tributary of the Bay. USGS science is creating solutions to improve the Chesapeake Bay ecosystem and mitigate human impacts on the ecosystem. For example, USGS research looks at how to make fish ladders effective for individual fish species to allow more fish to migrate upstream to spawn. Another project works to improve wastewater treatment plants to reduce wastewater discharge. USGS’ Fish Health Laboratory helps managers understand and identify fish diseases and has developed an early warning system for disease outbreaks. The agency, along with state and local partners, collects water quality data from across the region. USGS then analyzes this data and creates water quality analyses models and tools. Many of the tools, models and applications developed by USGS for the Chesapeake Bay ecosystem are also applicable and useful for other estuaries. Looking at the long-term data sets provides a solid basis to inform planning for the future. USGS scientists working in the Chesapeake Bay watershed are coordinating with counterparts in the San Francisco Bay and the Delaware Bay to ensure that their methodologies are consistent. ESA member Denise Breitburg (pictured above, center), senior scientist at the Smithsonian Environmental Research Center, moderated the panel. USGS panelists included Scott Phillips (pictured above, center), USGS Chesapeake Bay coordinator, Tom O’Connell, director of the USGS Leetown Fisheries Science Center, Ken Hyer, associate USGS Chesapeake coordinator, and Alicia Berlin, research biologist at the Patuxent Wildlife Research Center.